Mentoring is a one-to-one, non-judgemental relationship in which an individual voluntarily gives time to support and encourage another. This is typically developed at a time of transition in the mentee’s life, and lasts for a significant and sustained period of time. Mentors do not ‘teach’ the mentee, they give them the tools and guidance they need in order to achieve objectives independently. There is a lot of evidence from surveys across higher education institutions that technical staff do not feel their career and personal development is supported. There is a wealth of knowledge and experience available that technical staff could utilise and mentoring schemes are a useful platform for doing so. This guidance has been developed to support anyone who is considering introducing mentoring as a means of supporting technical staff career and personal development. The aim is to introduce the decisions that are needed to be made and to provide options and examples to help you make them. The information provided here is sourced from experienced technical staff, higher education establishments and experienced human resources advisors who work in staff development across the sector. This guidance outlines the process of setting up and using a formal mentoring scheme, however, the decision needs to be made as to whether a mentoring scheme is actually what is required. There are a number of other options that could be used instead, but these would also work alongside a formal mentoring scheme. Is there already a general staff mentoring scheme in place? If No, the following steps should be considered when planning a scheme. You may also find these steps useful if you are adapting an existing scheme. Establish the aims for your scheme. Decide who will be eligible to participate as mentees and mentors. Consider what type of mentoring is appropriate. Clarify what resources will be needed. Ensure there is a clear recruitment process in place. Decide what process will be used for matching participants. Monitor and evaluate the mentoring scheme and decide how the evaluation data is used. Why is a scheme for technical staff being considered? (Issues highlighted by several reports include the need to provide clear career development opportunities and to ensure the current technical workforce has the flexibility to adapt and work across a range of disciplines). What are the aims for the scheme? (For example, contingency planning, developing current staff, addressing issues regarding recruitment to technical roles). How will the organisation (department, division etc). benefit? E.g. improvement in staff retention, culture within a team, productiveness of a department. How will mentoring fit with existing objectives? How will the scheme be promoted? (E.g. a launch event, workshops, all staff email). How will mentors be recruited? E.g. focus on particular department, staff group, launch event. How will mentees be recruited? Forums could act as a source of mentors. Many establishments have their own internal technical staff forums or regional forums (e.g. Midlands group called M5, HEaTED). Click here for further information on Forums. What will be the required resources? Are there any cost implications? What are the time demands for setting up and running the scheme? Is there anyone that you need help from to recruit mentors and mentees? Would a ‘launch’ event help to get the scheme going? Is any IT support required for setting up a website for example? The resources required may be significant if there is no mentoring scheme at all in place. The best designed mentoring programmes won’t get far without effective programme promotion, mentor recruitment and training. In addition to participants, key leaders and stakeholders will need to be educated on the benefits of the programme and strategic value to the organization. Obtain the backing of a key member of the organisation as this can act as a ‘seal of approval’ for a new programme. Once the programme has been fully designed and planned, a structured launch event can be delivered. Consider the resources that will be required for such an event. (Key speaker, programme manager and support staff, line managers from the target area of the institution, potential mentees, catering, IT requirements, programme documents such as a handbook). Advertise the event and what it will aim to provide. (Consider if you would like mentor and mentee matches to happen at the event or later through a managed matching process). Invite forum committee representatives (e.g HEaTED, TechNET). This could help to increase the pool of mentors available. At the event, confirm participation in the programme of both mentors and mentees by asking them to ‘sign up’. Provide them with the personal profile template and ask them to submit this to a designated person. Confirm that confidentiality will be maintained at all times. After the event, evaluate how it went. Collate all of the mentor and mentee personal profile documents and create your pool of mentors. Mentees find a mentor via a website or other published source. Use an electronic matching system There are pros and cons to the different matching processes. Subjective rather than objective and relies on human decision-making. Very time consuming. Typically, the programme manager would need to work with colleagues to carry out the matching to ensure there is no bias and the process is effective. It partly relies on the people making the matches knowing the mentors and mentees. In large organisations this is just not possible. It’s objective. The programme manager can justify each match since it’s based on an algorithm or a set series of questions and criteria. The ‘system’ does the heavy lifting by suggesting appropriate matches. There’s no need to “hash out” the matches, so this method saves A LOT of time. The matches are already logged electronically which saves staff having to input data into a standalone spreadsheet or database. This website compares a range of products. Some may have a financial cost for their use. Once a mentor has been matched with a mentee then this needs to be communicated to both parties. It may be useful to outline on what basis the match was made (give examples of points outlined from each person’s profile document). Provide a guidance document to mentor and mentees and/or run an induction session. Ensure that both parties understand that the whole process must be confidential. 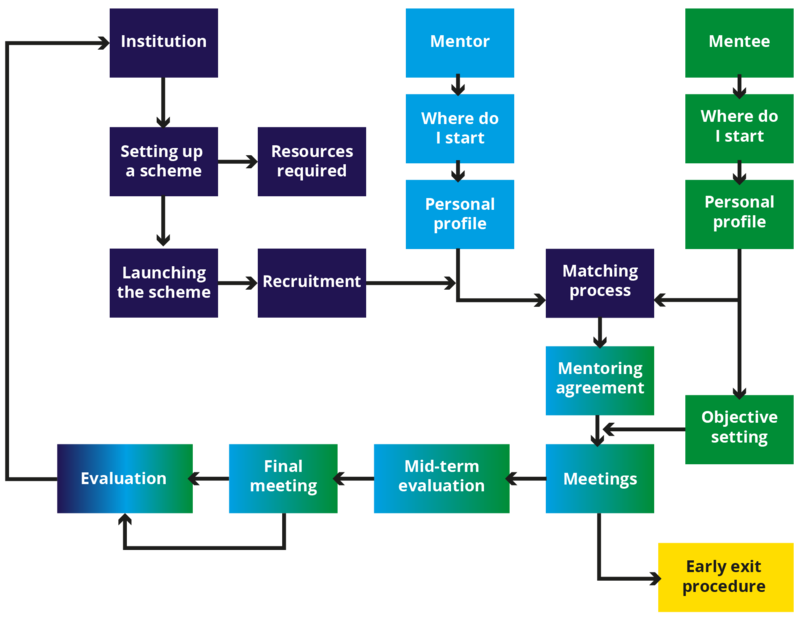 Outline the period over which mentoring is expected to take place and any defined end date. Provide full contact details for the programme manager or any support staff. Participants often want to know that there is someone who can help if difficulties arise, such as when a mentoring partnership seems not to be working well. Provide details of any training sessions/events that are planned for both parties. This needs to be carried out to ensure the programme and the mentoring relationships are meeting the initial objectives and are generally running smoothly. Information gathered during monitoring could form the basis of the final, formal evaluation process. Individual mentor/mentee relationships could be monitored to provide ‘case study’ based information and to ensure there is positive progress. Monitor the practicalities of the scheme such as locations of meetings, timings and how mentors and mentees keep in contact with each other. There are questions regarding this in the mid-term evaluation form. Use any evaluation or monitoring data to determine if any additional training needs to be provided to mentors and mentees. Training during the mentoring process will be immediately beneficial to both parties, rather than waiting to introduce training into any subsequent mentoring sessions. It is important that the scheme as a whole is evaluated and feedback is gathered from both mentors and mentees. Support must be provided to both parties throughout the process. It is important to try and ensure that none of the relationships break down. Use the mid-term evaluation and the end of term evaluation forms for both mentee and mentor. Decide what information you would like to get from evaluation data. Evaluation of the programme itself, rather than the individual mentoring relationships, could be carried out in group sessions. Feedback will come naturally if there is both focussed and general discussion about something. Mentoring is a significant investment when you consider programme management, infrastructure, and the valuable time of participants. Articulating the impact is essential to secure ongoing funding and support. In addition, the evaluation phase will provide an assessment of the programme health to identify trouble spots and opportunities. Evaluation information is no use unless it is used to make changes or improvements to any mentoring scheme. However, confidentiality is essential if feedback or evaluation has been obtained formally from individuals. If there is reason to share any evaluation, permission must be obtained from the individual and it must be clearly outlined who it will be shared with or how it will be used. Case studies are often generated as part of the evaluation process. They can also be used as publicity material when promoting the scheme to new audiences. There is a huge range of questions that get asked by both mentors and mentees about mentoring schemes. Below are some example questions with a few example answers, but of course, the answer will depend on your institution’s system. How long will the mentoring relationship last? Outline time frames in the supporting documentation. This could be a deciding factor for possible participants. I’m in a senior position but would like some guidance, can I still be a mentee? Who the programme is aimed at should be decided as early as possible. Ultimately, most mentoring programmes are open to anyone including senior staff unless they are at the most senior position within the organisation. This can be decided by the parties involved. Guidance around this should be provided in the supporting documents/handbook. What happens after the initial training session? How long should a mentoring session last? What if my relationship is unsuccessful? Why are face-to-face meetings needed? Why not just mentor over the phone and email? Should mentors or mentees take notes during mentoring meetings? What activities could I do with my mentee? What support will I receive as a mentor? What support will I receive as a mentee? Will I get to meet other mentors? Is the information shared at the meetings confidential? What happens to any evaluation information I provide? Do I have to have been a mentee to become a mentor?